Bandits went on a rampage at Bush Lot, West Berbice early yesterday morning, breaking into two homes and several businesses and in the worst of it C & S Computer Repairs suffered over $5M in losses and damage. An employee of C & S, Charran Singh told this newspaper that the bandits carted off two flat-screen monitors, a pair of speakers and ink from a printer amounting to about $2.7M. They also damaged $3M worth in equipment. 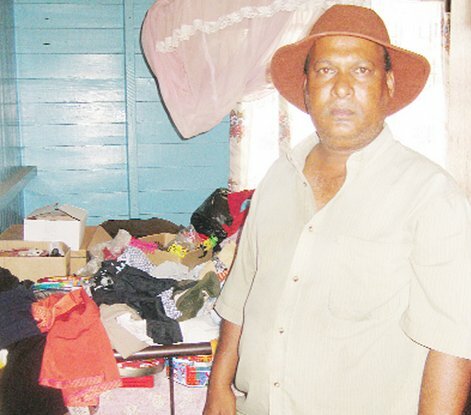 Khemraj Persaud standing in the room that the bandits ransacked while he and his family were asleep in two other bedrooms nearby. According to him the landlord went to open his hardware store located on the lower flat and noticed that the door on the bottom of the stairway leading to the computer business was open. He also noticed that the padlock had been ripped off and thrown on the ground. He immediately contacted the owner, Vishnu Mahadeo as well as Singh, who made checks and assessed his losses. When this newspaper visited yesterday a computer hard drive, printer and several other items were scattered on the floor. A piece of steel which the bandits apparently used to wrench open the locks was left on the counter at the C & S Computer Repairs. 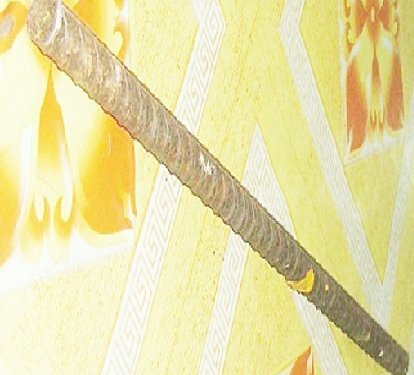 A large steel rod, which was apparently used by the bandits to wrench open the locks, was also left on the counter. discover that bandits had raided his home. while he and his family were fast asleep. A carton filled with tools, bicycle parts, cigarettes and chocolates was left behind on a table by the bandits. Items scattered on the floor at C & S Computer Repairs yesterday. The man also said that the robbers emptied two calculators and a radio set from his backpack that he used for work to stash some of their loot. He figured that the robbery occurred at around 3 am because when he got up at around 2 am to use the washroom everything seemed fine. He said he normally wakes up at the slightest sound and suspected that the bandits must have sprayed the house with some chemical so they would sleep through the robbery. damaged padlocks were also thrown on the floor. stole two five-gallon bottles and other items. opening up he discovered that the place had been ransacked. Sheriff also rents other sections of his building to the Cheddie and Sankar Fashions and the Little Rock Television Station for a sub-office and Salim’s Jewellery. evident that the bandits made a failed attempt to break into the jewellery store. Nikita Tejram, an employee of Little Rock said she got a call about the break-in and when she arrived she saw the drawers pulled out and photographs and other documents scattered all over. All that was missing, she said is a staple machine. ransacked but it is not clear if anything was stolen.